Located at 310 Crown St. between New York and Nostrand Avenues. 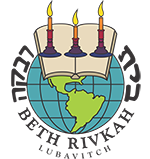 Our graduates leave Beis Rivka equipped with the skills, the knowledge, and the commitment to lead lives of meaning, of continual learning, and of both material and spiritual success. Our curriculum is carefully designed to give each student a firm understanding of the basic concepts of Jewish Law and Jewish and Chassidic Philosophy together with a broad knowledge of Tanach, Jewish and General History, and other fundamentals while ensuring each girl graduates with the skills to continue learning on her own and to constantly expand her Jewish knowledge. Our graduates have gone on to excel at some of the world's top seminaries and serve as successful teachers, shluchim, and community leaders while building strong Jewish families and homes.